The idea of “counting calories” seems like a tedious task. It tends to conjure up negative images of food obsessed individuals revolving their entire day around their diets and tossing individual blueberries onto a food scale in order to meet some perfect daily total. But is it really necessary to count calories as part of your fat burning or muscle building diet? Well, it really just depends on what you define as “necessary”. Is it possible to lose a significant amount of body fat week after week without counting calories? Yes. Is it possible to consistently gain new muscle size and strength without counting calories? Sure. It all comes down to how serious you are about your program, how precise you want your results to be, and what exactly you define as ”counting calories” in the first place. First off, what exactly are calories anyway? Calories are simply a measurement of the total amount of energy contained in the foods you eat. If your goal is to burn fat, you need to create a calorie deficit by burning more calories than you consume. If your goal is to build muscle, you need to create a calorie surplus by consuming more calories than you burn. This is the most foundational, fundamental dietary principle there is and it must be followed if you want to see progress. It’s not that cut and dry, though. There is also an optimal range that you’ll want to hit in order to achieve the best results. The figure I typically recommend is a 15-20% deficit for fat loss, and a 15-20% surplus for muscle gain. If you’re not counting calories in any real way, there’s a decent chance you’ll get the deficit/surplus aspect met (though even this fails in a lot of cases), but a pretty good chance that it won’t be in the optimal range. Well, if your goal is fat loss, and your deficit is less than 15-20%, you simply won’t lose fat at your maximum potential. If it’s greater than 15-20%, you’ll still lose fat, but you’ll also lose an excessive amount of lean muscle tissue in the process. If your goal is muscle gain, and your surplus is less than 15-20%, you won’t gain muscle at your maximum potential. If it’s greater than 15-20%, you’ll still gain muscle, but you’ll also gain an excessive amount of fat as well. a) Maximize fat loss while minimizing muscle loss. b) Maximize muscle gain while minimizing fat gain. If you simply “wing” your diet, it’s going to be pretty hard, if not impossible to accomplish this. First, you can go the ideal route and simply track everything. 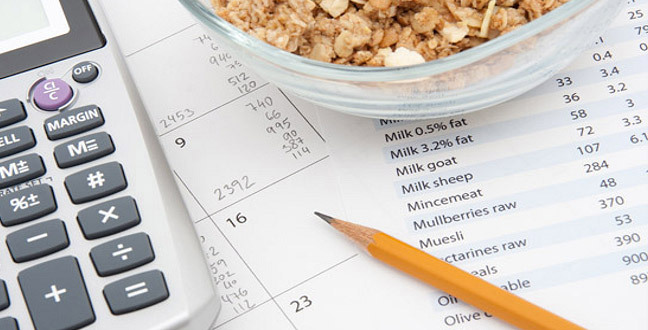 Find out what your daily calorie/protein/carbohydrate/fat needs are based on your goal, find out the nutritional content of the foods you’re eating (you can use an online nutrition database like calorieking.com), and then structure a daily meal plan for yourself. It’s actually not as difficult as it seems – it just takes a bit of time to initially plan it out. Find your daily nutritional needs, get a good idea of the nutritional content of the foods you typically consume, and then just do your best to stay within the right range without actually tracking every single calorie. It’s really up to you. It depends how serious you are about your results and how much effort you’re willing to put into your diet. Option number 1 is obviously going to yield the best possible results, but option 2 can also work decently well with some reasonable focus and discipline. One thing is for sure though: you definitely need some sort of system in place where you understand what your daily calorie/protein/carbohydrate/fat needs are and have a reasonably accurate idea of what you’re taking in through your diet. Otherwise, you’re just shooting darts with a blindfold. Try to completely “wing” your diet and there’s a very good chance that you’ll be burning fat or building muscle well below your potential (or losing muscle/gaining fat to an excessive degree), or even worse, wasting your time in the gym altogether. Proper fitness nutrition is not rocket-science, but don’t make the mistake of thinking that calories don’t matter. If you truly want to achieve an impressive, head-turning body, they absolutely do.